What drove Energid to create the Cyton? Energid got its start developing advanced control software for NASA.NASA needed a way to control very complex, humanoid robots in real time. The software we developed ultimately evolved into the Actin software framework, which Energid sells commercially. Early on we were looking for better ways to market our software. Though we had this fantastic and powerful software, we did not have hardware that would display its power—the robots NASA was using were hundreds of thousands to millions of dollars. It was this need for hardware to market our software that initially motivated us to develop the Cyton. What differentiates the robot from others on the market? The Cyton robot was built from the ground up with accessibility in mind. By that, we mean that the arm was developed for use by regular people. You do not need to be an engineer to use this arm. In fact, our goal is to have customers doing useful work with the arm in the first day. The robot comes with a quick-start guide that should have customers up and running in 15 minutes. Another differentiator for the Cyton is its size. We like to call the Cyton disruptively portable, because it’s the first robot of its kind that can easily be moved without any special machinery. The largest model we make still weighs less than five pounds. Anyone can pick up and carry a pair of Cyton robots, one in each hand, with ease. Have you identified your main markets? Robots are getting smaller, cheaper, more powerful, and easier to use. This trend will enable broad acceptance of robotics, and with that myriad applications, many of which we can’t envision today. A large initial market is manufacturing. It’s a surprising fact that virtually all smartphones in use today are assembled by hand. The heavy, difficult to program, and expensive industrial robots common in manufacturing plants do not provide the ROI to compete with labor costs in countries like China and India. And even if a manufacturer invests in a robotic workcell for a particular product, the workcell may be obsolete with the next generation of the product. Current industrial robot workcells are highly specialized and hard to program. A rule of thumb is that workcell integration is 80% of total cost. The Cyton addresses this by simplifying integration. The Cyton is easy to train. No specialized knowledge is needed. 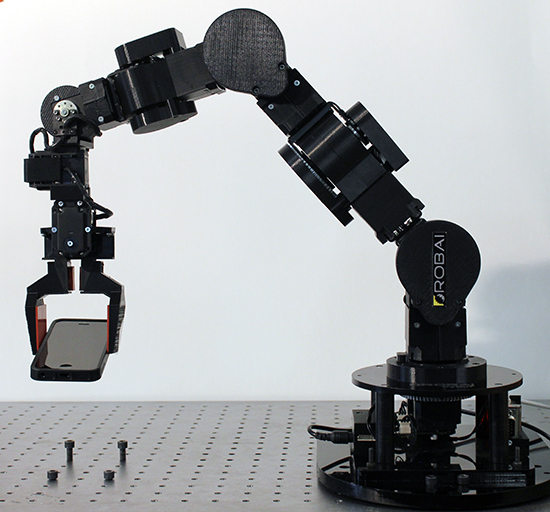 Most traditional robot arms have six or fewer axes. The Cyton has seven axes. Why is that? Robots with six or fewer axes have been easier to control. Once the number of axes goes beyond six there is usually no closed form solution for the robot motion. The special software used with the seven-axis Cyton, though, makes it just as easy to control as those traditional simpler arms. Intuitively it makes sense that more axes would be better from a tasking perspective. Think of the human body; our many joints allow us to reach around obstacles and expand the area we can control. To prove this to yourself, try controlling a five or six axis robot with a joystick or mouse and see how difficult and time consuming it is to do a meaningful manipulation task. Even with the full power of the human brain, trivial tasks become challenging when using only a few axes. By leveraging Energid’s unique control approach originally developed for NASA, the Cyton leverages the extra degree of freedom to avoid obstacles, optimize for strength and precision, and maximize the workcell usefulness. The motion of the Cyton is fluid, moving more like a human arm than a traditional robot arm. Can you run us through a typical programming session for the Cyton and describe the steps and skills involved? Since the software computes the trajectory at run-time, the path can change based on changes to the environment. Let’s say, for instance, that an obstacle was added to the workspace after the original sequence was created. The Actin software will compute a path around that obstacle (moving the elbow out of the way, for example) to still reach the goal positions. This ability means that changes in the environment will minimally impact the tasks created. How many robots have you sold to date? To date there have been over 200 Cytons sold. The latest generation, Cyton Gamma, is positioned specifically to address the light industrial market. We anticipate substantial volume as our product is proven out in this space. We are working with a few large companies that are beta testing the arms right now. Please describe a typical Cyton design and installation project from start to finish including how the various players work together to reach a working solution? Cyton integration is simple. The robot connects to a standard PC using USB. A typical setup involves a few simple steps. The operator has to install the software on a computer, mount the robot in the workcell, and connect the robot to the computer by USB. At this point, upon running the software, it will be possible to interactively control the robot through the PC. All of the graphical training tools will be available through the GUI. A basic sequence can be recorded within the workcell by placing the arm into a zero-torque assistive mode (through the GUI) and moving it to teach points. It is also possible to record complete sequences. These sequences can be added to a database of sequences. The operator can build higher level sequences from basic ones. What will you do with the START grant funding? The START funding will be used to support our beta installations and to accelerate the introduction of our existing and next generation Cyton robots into the marketplace. We’re grateful for the START funding as it will help us take the robots to the next level. Where do you see the Cyton applied in the years ahead? In the short to medium term, we see the Cyton addressing applications in several domains. The arms are currently being evaluated by a large healthcare provider. We’re also seeing strong interest in automated testing and inspection. The real power of the Cyton, however, is its accessibility. A portable, safe, dexterous, robotic arm that can be used by anyone has disruptive consequences. When computer technology moved from mainframes to personal computers, early hobbyists embraced it and found new and innovative ways to apply it. This ultimately led to a computer revolution. The Cyton, we believe, holds the same promise for robotics. Neil Tardella is the Chief Operating Officer at Energid. He provides operational leadership and supports strategic direction at Energid. He has spearheaded commercial initiatives in the energy, medical, and low-cost robotics sectors. Prior to joining Energid, Neil held key R&D and management roles at Northrop Grumman Norden Systems, Sikorsky Aircraft Corporation, and Technology Service Corporation. Neil has a B.S. in Electrical Engineering from the University of Hartford and a M.S. in Computer Science from the Polytechnic Institute of New York University.